Nowadays, its impossible to think of a computer without a CD-ROM or DVD-ROM drive, but it was just 10 years ago that they began to become commonplace. I remember then that the CD-ROM was touted as the next big thing - it was going to revolutionalise education, home learning and information technology. The reality, of course, is hugely different. While it has worked for a select few applications (encyclopedias in particular), few of us want to spend hours in front of a computer screen reading what is essentially a glorified interactive book. 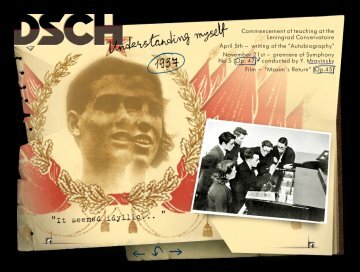 So it was with a large grain of scepticism that I approached the Multimedia DVD-ROM about Dmitri Shostakovich. Was it to be like a recent spate of music-themed CD-ROMs - simplistic, banal, awkward to navigate, with a few snippets of well-known tunes thrown in at random? I am happy to say that this set, which appears on both DVD-ROM and CD-ROM is a absolute triumph, fusing the technology of digital media with a truly deep and relevent exploration of one of the twentieth century's greatest composers. Lets click on each menu option to see how this extraordinary DVD works. 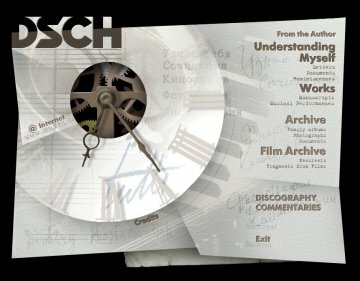 A short, artistic introductory video, custom-made for this DVD and CD, which sets the tone for the further exploration. 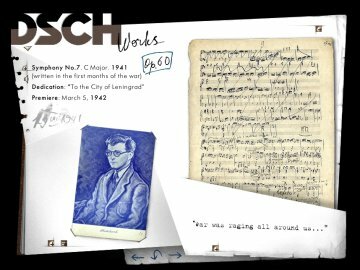 This option explores the life of Shostakovich using his own letters, journals and reminiscences, most of which has never been published before. The years of his life are shown on the circle which you can rotate to get to his later years. Opus numbers of the works written in each year are shown on the circle. 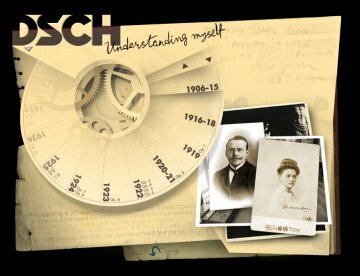 You can then click on any year to explore further. Each year is represented by a separate page, an artistic collage of photos, quotes, and musical works from that year. 1937 is shown below. The collage is hyperlinked to other sections of the DVD. Click on the photos to see them in greater detail. Click on the opus numbers to explore the musical works. 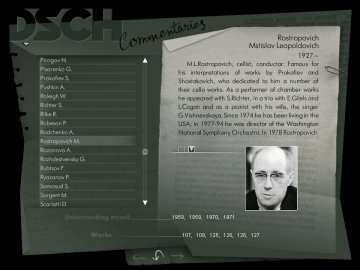 Click on the names to see more about the people who influenced Shostakovich in that year. Probably most significant in this section is the documents from Shostakovich's life. Click on the text exerpt to bring up the entire translated text - Shostakovich's thoughts, inspirations, trials and tribulations. Over 250 separate documents, most never seen before, are included. 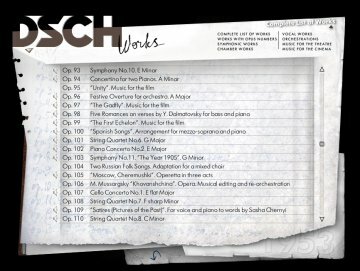 The next section includes every piece of music Shostakovich ever wrote. The opening page shows all the opus numbers on an ingenious interactive grid. Or you can view the complete list of works in text format, filtered by orchestral, chamber, theatre etc. 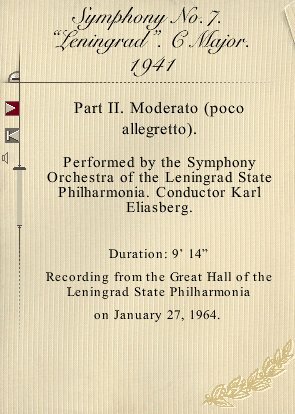 Lets click on the Symphony No.7, the Leningrad, Opus 60. This brings up another interactive collage. Again you can explore the works further. 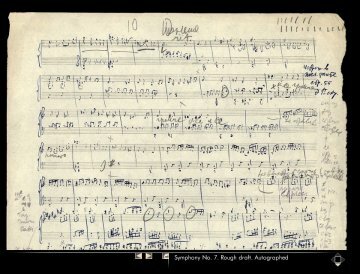 Click on the score to view the original hand-written score in detail, usually the first page or two are provided, showing Shostakovich's struggle to come up with the final result. And most fascinating, click on the speaker icon to hear an exerpt from the work. There are 87 samples of music, some quite short, but some are entire movements. The performances are sometimes by Shostakovich himself, or a recording of the premier performance, or a respected performance from the time. 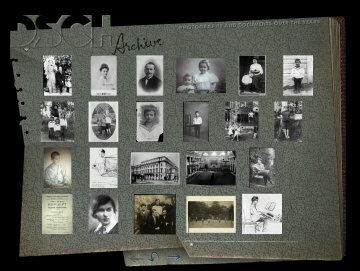 This section is of photographs and scanned documents from Shostakovich's life. There are over 800 photopgraphs, dating from his very early life up to the the year of his death. Some are stiff official images, some are warm family snapshots. 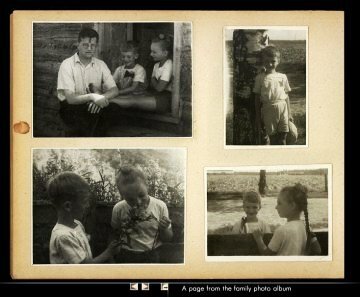 The family albums brings human quality that is often neglected in pictures of Shostakovich. Shostakovich playing with his son Maxim in the coutryside, Shostakovich holding a kitten, Shostakovich with his wife. 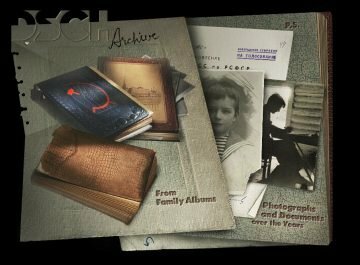 The other photographs and documents over the years includes official and family photos, program notes, passport images, publicity shots, cartoons and other fascinating tidbits. All are clickable to show them at full resoilution, and can also be watched as a slideshow. The film archive is possibly the most interesting section af all. There are 33 selections on the DVD-ROM and 15 selections on the CD-ROM. They are quite short, some just a minute long. Some are silent, but most have sound, and the spoken Russian is subtitled. 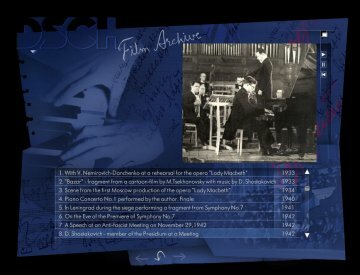 Here we see newsreels of Shostakovich composing, leading masterclasses, making speeches as well as performances of many of his works and movies for which he wrote music. Shostakovich performs many of his own works on the piano, some of them pre-dating the orchestral premiers. Most ominously, we see Shostakovich at the dreaded meeting where his music was denounced as formalistic. The look on his face is a man not just in fear of his career, but in dread of losing his life. 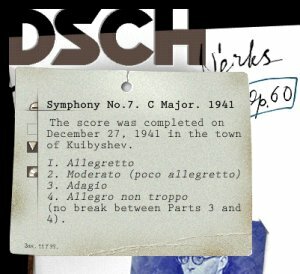 The discography is an exhaustive list af every recording of Shostakovich works, accurate up to 2000. It includes historic and modern recordings on both LP and CD, and provides and invaluble reference. And finally, the commentaries section provides short autobiographical details of almost every person mentioned in the texts, all hypertext linked. Family, friends, collegues, enemies, performers and interpreters of his works. This is an enourmous resourse for the Shostakovich fan. There is more information here than anybody could ever want. I have spent several sessions with the DVD-ROM version, each lasting 2 to 3 hours, and I have still barely scratched the surface. The navigation is superb. The viewer does not have to follow each section methodically, but is seamlessly taken to whatever relevent section is clicked on. Take a chronological tour, or just explore a small group of works. Watch movies in isolation, or just when they are relevent to the topic at hand. The collages are beautiful and interesting, as well as being interactive. Part of the fun is discovering what text, music or photos are available within each collage. The music samples are historically fascinating, and Shostakovich demonstrating his own works is incredible. 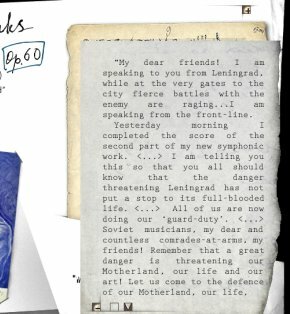 Some of the texts in the Archives section are not translated, which makes them somewhat irrelevent to non-Russian speakers. Luckily most have English, French and German translations. The movies have no time-line, so the viewer has no way of knowing how long the clip is, and no way of rewinding to a particular section. The silent movie clips have a somewhat irritating projector sound overlaid. The biggest deficit is a lack of description of each musical work. Sure, we get all the technical details, we get Shostakovich's reminiscences and thoughts on each work, and can listen to many of them too. But we dont get an editorial discussion of how the work fits in with Shotakovich's themes and times. Perhaps this is because the focus is more on Shostakovich himself and his life. The DVD-ROM contains 33 video clips while the CD-ROM has only 15. 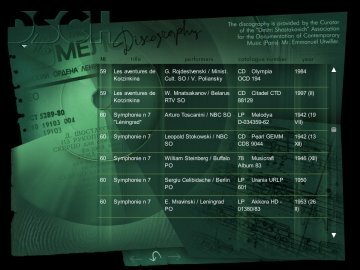 In addition, the music samples are recorded at higher quality on the DVD version. Please note, this is a DVD-ROM that plays on a computer (with a DVD drive installed). It will not play on a DVD player attached to a TV. If you have the equipment to run the DVD-ROM, buy this version. Otherwise, the CD-ROM will play on almost any computer, Windows or Mac. This is an essential experience for any Shostakovich enthusiast. I would also recommend it to anyone who is wondering what the big deal is about with Shostakovich. This set is what the CD-ROM revolution was supposed to be. 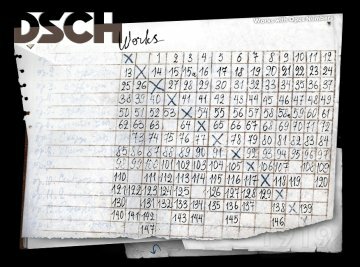 A rich, intuitively interactive multimedia experience that shows us Shostakovich in a way that no other medium can. by purchasing this CD using this link.